The ABC's Indonesia correspondent David Lipson said a witness on the nearby Gili Islands reported thousands of people fleeing to higher ground. LOMBOK QUAKE: A source on the ground in the Gili Islands says around 3,000 people fled to high ground... huddled in the dark, frightened, some wearing life jackets and praying after each aftershock. There are also reports of fatalities on the Gili Islands, situated off Lombok's north-west coast. Prime Minister Malcolm Turnbull is contacting the Indonesian President today to offer Australia's help to cope with the earthquake. "We always reach out to our neighbours when natural disasters strike," he said. "Obviously Australians have been affected, they felt the shock, including Minister Peter Dutton who was at a counter-terrorism conference in Lombok," he said. "There are a lot of Australians in Indonesia at any time, so our consular services will be doing everything they can to ascertain the safety of Australians." "Very grateful to Indonesian police and authorities and the AFP," he tweeted. Australia's consul-general to Bali Helena Studdert said Australians should follow the instructions of local authorities during the emergency. "As the quake happened, we were sitting in the Trattoria Restaurant when the table began to sway," Mr Finlayson said. "A few muted screams came from around us and we said, 'It's an earthquake — we need to get out of here'. "We were the first out and the rest of the diners spilled out onto the street … It only lasted a few seconds but it shook us all up in every way with a young woman sobbing [nearby] and [being] supported by her family. "The locals also seemed a bit disturbed although it was business as usual. Cars and scooters continued on the street outside seemingly oblivious to the interruption to the ground and life on top of it." 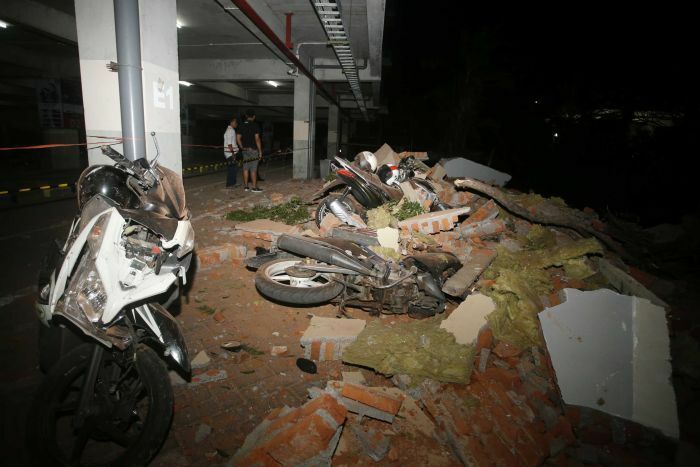 Singapore Law and Home Affairs Minister K Shanmugam, who was in the Lombok town of Mataram at the time of the quake, wrote on Facebook that his 10th-floor hotel room shook violently and walls cracked. "It was quite impossible to stand up. Heard screams," he wrote. "Came out, and made my way down a staircase, while building was still shaking. Power went out for a while. Lots of cracks, fallen doors." On Lombok, soldiers and other rescuers carried injured people on stretchers and carpets to an evacuation centre. Authorities shared footage of locals being evacuated from the Gili Islands by boat. "I was watching TV when I felt a big shake," said Harian, a Lombok woman who uses one name. "The lamp was shaking and people were shouting, 'Get out'. I ran out into the dark because the power cut off." Najmul Akhyar, district chief of North Lombok, told MetroTV there was an electrical blackout so he was unable to assess the entire situation, but that at least three people had been killed. There had been a half hour evacuation at the Lombok airport following the quake because the electricity went off. TV showed crying women consoling each other outside the airport. There was also damage at Bali airport. This morning, tourists queued at the airport on Lombok looking to get away from the devastation, but some said there were no flights off the island for several days. A magnitude 6.4 quake hit Lombok on July 29, killing 17 people. Like Bali, Lombok is known for pristine beaches and mountains. Hotels and other buildings in both locations are not allowed to exceed the height of coconut palms. Indonesia is prone to earthquakes due to its location on the Pacific "Ring of Fire", an arc of volcanoes and fault lines in the Pacific Basin. In December 2004, a massive, magnitude-9.1 earthquake off Sumatra island triggered a tsunami that killed 230,000 people in a dozen countries.